The German veterans sound remarkably like their classic selves on their new LP. The latest platter from Scorpions, a band that turns 50 years old this year, might as well be called 1991 because it picks up right where the previous year’s Crazy World left off. You’d be allowed to think, “Wow, these guys really managed to go back and relive the zeitgeist of their platinum era without much effort." But that’s only part of the story. A few years back, the Scorps decided to make a new album with old material, songs that dated back as far as 1982’s Blackout and stretched all the way to the aforementioned Crazy World, the album that gave “Winds of Change” to the world. It’s been done before. King’s X took a similar approach to making 2003’s Black Like Sunday, which featured tracks written during the group’s club days. But it’s unlikely that anyone could have pulled this off with the enthusiasm and dignity that the Scorpions have. Keep in mind that some of these songs were little more than scraps when the boys returned to them, so the idea that the songs would be better because they were conceived when the group was on a winning streak doesn’t exactly hold up. These songs wouldn’t be written if the legendary quintet didn’t feature a couple of gifted writers and arrangers, the same guys -- Rudolf Schenker and Klaus Mein -- who gave us hits such as “Rock You Like a Hurricane”, “Big City Nights” and “Rhythm of Love” (Mattias Jabs, no slouch of course, contributes but is less prolific than his mates). Scorpions can get away with some things that no one else really could: “Rock My Car” is a party song through and through and its almost mindless lyrics would read as throwaway and hackneyed coming from pretty much anyone else. But you can’t help but sing along or feel the deep desire to get behind the wheel and rock your own car (and, as the song pretty much commands you to do, put the pedal to the metal). Others, such as “Gypsy Life” and “Rock ‘n’ Roll Band” celebrate this group that is going stronger than probably anyone could have predicted all these years later. It’d be a lie to say that the band has not exhibited signs of stopping:some of the things which led to Return to Forever’s creation included the promise of a farewell tour back around 2010 but the band quickly discovered that it was having too much fun to stop and so has kept on keepin’ on, and probably will well into the future. Here, Meine, a singer who has suffered his share of vocal problems, sounds as good as he ever has, remarkably youthful and precise. His ability to travel between ballads and rockers remains intact, and never has a non-native singer of English sounded as impassioned as he. The celebratory vibe heard throughout is also evident on two tracks that are from more recent times -- 2014 to be exact -- and written with help from Mikael “Nord” Andersson and Martin Hansen, the men who produced the album. Those tracks, “We Built This House” and “Goin’ Out With a Bang” are cut from the same cloth as the others but are more celebratory than merely hedonistic (and hedonistic is something this band has been accused of being again and again and again) and remind us that in this camp friendships run deep. At this point they’d have too, right? 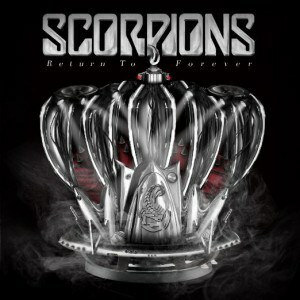 Return to Forever also comes at a time when the band is getting ready to reissue several of its classic albums with plenty of bonus material to go around, a time when the world wants and needs Scorpions more than ever. In keeping with the spirit of these times, the record is available in a variety of editions and includes material that is frequently as good as anything on the main album and makes you wonder just how deep the arachnoid archives run. We don’t know that this will be the final Scorpions LP, but if it is, the little band from Hanover will certainly have gone out with, as they say, a bang.